Hit the gridiron for this fast paced sport! 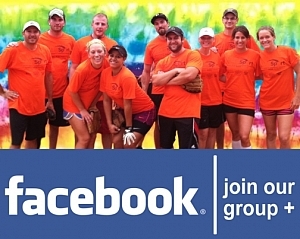 Club Sport offers coed and men's flag football leagues for all abilities. Coed rules are tailored so everyone has a chance to get in on the action. The season includes 7 regular season games with everyone making a single elimination playoff at the end. Provided with the league are 2 officials, team shirts, online schedules and standings, prizes for champs, after season party, and more! Get your team together or sign up as a free agent and we'll find a team for you! See you on the field! Pick a league near you! Filter by LOCATION, DAY OF WEEK, and SPORT so you can see exactly which leagues are the best fit for your schedule! New leagues and locations are added all the time and leagues are played year round - usually 4-5 seasons a year. Our goal is to get you playing and to GET OUT, GET ACTIVE, & MEET NEW PEOPLE! If you have any questions about Club Sport leagues or how to sign up, call us at 954-589-2180 or EMAIL US! Get your team ready in 2 minutes! If you don't have a team, no problem - we specialize in placing "FREE AGENTS"! Depending on availability we can help find you a team. Just sign up online and guarantee your spot with a credit card. We won't charge your card unless we find a team for you! If you're not placed, no worries, you won't be charged. Individuals and small groups of friends not already part of a full team should note all of your friends in the "Players to be Teamed With" box and we'll place you on the same team.SIGN UP FOR A LEAGUE TODAY!